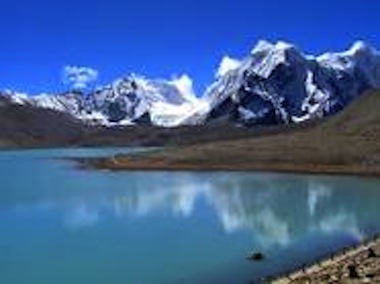 Sikkim is a northwestern Indian state in the Himalayan mountain range. Some think the state's name means palace or house, while others think it means garden of the war god. It’s bordered by Nepal to its west, China's Tibet Autonomous Region to its the north and its east, and Bhutan to its southeast, and West Bengal to its south. The state’s population is only about 600,000, which makes it India’s least populated state. Other than the state of Goa, it’s India’s smallest state by area, encompassing only about 2,700 square miles. The climate ranges from subtropical to very cold due to its location. The world’s third highest mountain peak lies on the Sikkim and Nepal border and this state is the only one in India that has a Nepalese majority population; there’s a story that explains this. Legend states the Buddhist saint named Guru Rinpoche visited Sikkim in the 9th century, introduced Buddhism to the region and predicted the region would be ruled under a monarchy. In 1642, a monarchy called the Namgyal Dynasty ruled the region, but lost territory to the Nepalese during conflicts that spanned one-hundred years. It protected itself under the British, until it was later annexed. The state became an Indian state in 1975. Languages spoken here include Nepali, Bhutia, Limbu, Newari, Rai, Gurung, Mangar, Sherpa, Tamang and Sunwar. The primary religions practiced here are Hinduism, Christianity, and Buddhism, but other minority religions are practiced too. The economy of Sikkim relies on its agriculture and tourists coming to visit. This small state has the fourth smallest GDP among all Indian states, but it’s growing at a rate faster than most, so it may catch up! Because it's culture is so rich and it has such a gorgeous terrain, the state is a very popular tourism destination. A unique feature that affects its tourism level is that it also has the only open border to China in India. Sikkim has had an interesting history. In 1700, the Bhutanese ruled parts of the region, followed by the Tibetans. In the early 1700‘s the Tibetan kingdom was raided by the Nepalese multiple times, who nearly took it over, until China sent in troops to protect its interest in 1971. China defeated Nepal and then took control over parts of the region. Once British rule began in India, Sikkim joined with Britain to fight Nepal. The British attacked Nepal and started a war called the Gurkha War of 1814. Sikkim and Nepal then signed treaties that released the disputed land from Nepal, but also allowed the British to heavily tax the people. Conflicts emerged between the state and the British, which resulted in the Brits taking over more of the state. In 1947, India gained its independence from Britain and created a state council in 1955. While this was happening, Sikkim’s congress held elections to better represent the Nepalese, who now lived in its borders. A man named Palden Thondup Namgyal was the state’s elected leader in the early 1970’s, but was unpopular. Riots took place during his rule that lead to the state asking India for protection. In 1975, India’s army took control of its new state. On 16 May 1975, Sikkim became the 22nd India state. The state is mostly mountainous and has regular snow fall. Its elevation ranges from 920 feet to 28,000 feet above sea level and most of the land is no good for farming.However, some hills were made into farms. Many chilly streams eroded river valleys in western and southern parts of the state, which combine to make the state’s largest body of water, the Teesta River. Their are twenty-eight peaks and close to one-hundred glaciers in this state and a popular drawing for tourists is health related. Sikkim has natural hot springs, famous for high sulfur content and an average temperature of 122 degrees Fahrenheit. These are said t help people who suffer from an array of health conditions. A crazy fact about this state is that it has more than 5,000 plants that grow flowers. It also houses the Red Panda, snow leopard, clouded leopard and many more exotic animals! Many Hindu festivals, like Diwali and Dussera are celebrated here, as well as other local festivals. The Buddhists in the region celebrate holidays like Losar, and Loosong. Christmas is promoted in the capital city of Gangtok to cater to western tourists. The most popular music here are western rock and Hindi music. Indigenous Nepali rock and Lepcha music are also popular. The state's popular sports are football and cricket and hang gliding and river rafting are here too. When it comes to food, this state is different from much of India. First of all, people eat a lot of meat here and noodles. In fact, noodles are huge here! In most of India, rice is the staple part of most every meal, but here, it is noodles. Perhaps this is due to its close proximity to countries like China where noodle and pork consumption is also high. Dishes like chowmein and wonton are enjoyed often in Sikkim. Dumplings filled with vegetables and buffalo or pork are popular. People often eat pork and soup as a standard meal. People here also drink alcohol, which is either banned and sold illegally, or seemingly non-existent in most Indian states. Beer, whiskey, rum and brandy can all be found here, so cheers! The state joins ranks with Haryana and Punjab as a non-dry state. The state has twelve colleges or higher education institutions. The largest is Manipal University which focuses on engineering, medicine and management; a number of technical universities exist in the state as well. Even so, many students choose to attend college in other states. Most of the state’s internet users access the world wide web through internet cafes, or pay by the hour internet hot-spots. So in short, it is a growing state, with excellent tourism options! Leave Sikkim to visit other India States.